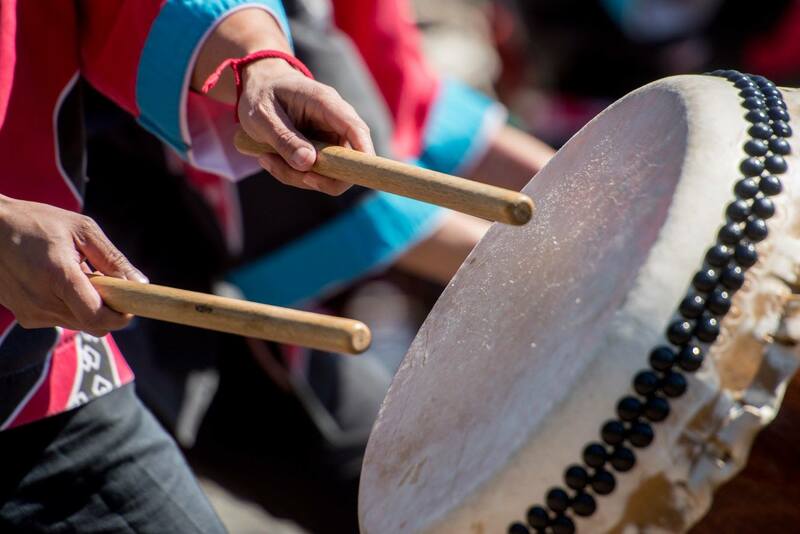 KyoDaiko is a Philadelphia-based community taiko drumming ensemble. Our members are volunteers who perform for love of the art and the energy that the great drums bring us. We perform regularly at a variety of events: from school and community festivals, to Phillies baseball games, Japanese festivals (like D.C.’s National Cherry Blossom Festival), to more unusual gigs like roller derbies and dragon boat regattas. In 2013, KyoDaiko was showcased during the Philadelphia International Festival of the Arts (PIFA) in a commissioned piece with Kaoru Watanabe, performed both at the Settlement Music School and at Shofuso Japanese House and Garden. The group was founded in 2005 and originally led by Kristopher Rudzinski, who studied and performed with Marco Lienhard’s group Taikoza in New York. The group’s membership comes from a wide variety of backgrounds, and continues to grow with new students and continuing players. Members attend regular classes throughout the year and participate in workshops with master teachers from around the world. A wonderful article was written about our visit to The Heritage of Green Hills. Alternate forms of fitness was the highlight of the segment, as KyoDaiko demonstrated the fitness aspect of playing taiko on NBC’s The 10 Show! KyoDaiko was featured on Hulu as part of a show called America’s Greatest Otaku. Stu and the Otaku Six travel to Philadelphia, Indianapolis, and Louisville to meet with Joey Hansell, this weeks’ Otaku Contender, and visit Shofuso Japanese House and Garden, GenCon, the Indiana State Fair, and Ultra Pop. On May 22nd, 2010, KyoDaiko was featured on ABC Channel 6’s show “Visions”. The TV show highlighted Asian culture around Philadelphia, including food, lifestyles, and art forms. “After the lunges and other stretching, June Washikita O’Neill mans the odaiko, the large drum that is the heart of the ensemble.